Saturday, June 20, 2 p.m.
Sunday, June 21, 7 p.m.
Saturday and Sunday, June 27-28, 6 p.m.
Sunday, June 28, 2 p.m.
Monday, July 6, 7 p.m.
"The Three Lives of Derreck Kayongo"
Tuesday, July 7, 7:30 p.m. It is the nature of the arts that conversations between the artist, the audience and the work often begin and end with a final product. Patrons rarely get a glimpse behind the veil of creativity; however, many of the most exciting discoveries surface during the creative process. But for three years, Theater Emory’s Breaking Ground series has provided an uncommon opportunity: a space where artists can come together to exchange with fellow creators and share their processes with the community. This week, the Breaking Ground series returns with public presentations occurring June 20-July 11 in the Theater Lab of the Schwartz Center for Performing Arts. The four-week long laboratory brings students, alumni, faculty, staff and professional artists from Atlanta and beyond to work on seven different projects. Each project has time in the Theater Lab to develop work, following which the creators invite the public to view and respond to their ideas. Fresh off the heels of the successful Cryptophonic Tour at Oakland Cemetery, the Atlanta-based Callosum Collective will use Breaking Ground to venture into the theatrical form with "The Squall" (June 21), an adaptation of Shakespeare’s "The Tempest." 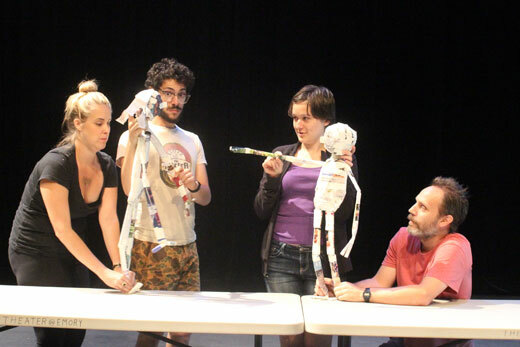 "This is Callosum’s first attempt at a theatrical production, so having unfettered access to Emory’s Theater Lab is an absolute dream for us," says co-director Devin Brown. "It will be thrilling to be ensconced in such a challenging, creative and intellectual environment and we are excited to see how it inspires the work we end up producing." Another project, playwriting event "4:48" (July 11), will result in four brand new plays by Atlanta-based playwrights Johnny Drago, Daryl Fazio, Michael Winn and Emory University Playwriting Fellow Edith Freni. Commissioned by the Playwriting Center at Theater Emory, "4:48" draws inspiration from Pulitzer Prize-winner Paula Vogel’s famed playwriting "bake-offs" in which writers have two days to create work responding to a common source material. "I’d been looking for a way to get some Atlanta-based playwrights over to Emory during my fellowship and the bake-off process sounded like a perfect opportunity to make that happen," explains Freni. "I brought the idea to Lisa Paulsen, director of the Playwriting Center, and we ran with it." While a space to experiment and exchange with other artists is an invaluable part of the creative endeavor, the opportunity is, more often than not, a luxury. "People talk a lot about the value of process, but it’s actually very rare to find a place that gives you the time and space to develop work," explains playwright Patricia Henritze, an alumna of Breaking Ground who returns this year as a collaborator on two new projects. "As an artist, it’s incredible to be part of a program that encourages you to explore, percolate and shape ideas for work even in its earliest stages."